Cancun and the Riviera Maya are literally scattered with luxury resort hotels. If you like these big resorts with all the amenities of a cruiseliner on land, then this page is for you! Then suddenly things got wild. The Riviera Maya was launched as an important tourist destination rivalising with Cancun. Developers came like bees to honey and luxury resort hotels were popping up everywhere. Ecclectic Playa del Carmen has become the hub of riviera tourism and, of course, Cozumel is an important cruise destination. Today the whole coastline between Cancun and Tulum is dotted with luxury beach hotels with lush gardens and infinity pools, one more alluring than the other. Within a few years there will be a second airport, at either Puerto Aventuras or Tulum. Meanwhile development is spreading further south at the Costa Maya. Even Si'aan K'aan biosphere is not respected by builders. 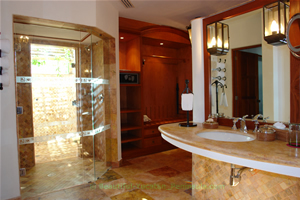 Within the large variety of luxury resort hotels each one comes with its own style, amenities and price-tag. There's no shortage of choices here! First you'll have to decide where you want to be. Cancun's Hotel Zone is a former sand dune which doesn't allow for much room between hotels. Buildings can be rather high compared to the Riviera resorts. Do you want your luxury resort hotel to be Adult-only? Family-orientated? All-inclusive or just the opposite? Some resorts offer swim-up suites, others are surrounded by international level golf courses. Or maybe you're hooked on a specific architectonic style and decoration... Mexican, Mediterranean, Oriental? To be honest with you, as a tour guide doing daytrips to Tulum and Chichen Itza I do not stay in these hotels. But from what people tell me I have a pretty good idea of how they respond to the services offered and I feel confident about my recommendations. Two of the largest luxury resort hotels on the Cancun-Tulum corridor are Moon Palace and Iberostar Playa Paraiso. Both have excellent standards of quality and both offer the most challenging golf courses in the area. My personal choice would be Playa Paraiso. It is a gorgeous resort with five hotels, each one with its own distinctive style and architecture. Among all the larger luxury resorts on the Mayan Riviera I find this one has risen above the rest with its own charm and personality. Personally I like the Lindo, with its moorish-style lobby and chapel-like reception area.Playa Paraiso Maya has a copy of the Kukulcan temple at Chichen Itza with an impressive Chac Mool inside to welcome you. The newest lobby, and adults-only, is the Grand Paraiso. Much smaller and renown for excellent service are the Secrets resorts. Conde Nast Traveller honors the Capri for extraordinary standards of service. Secrets Maroma Beach is at arguably the most beautiful beach on the Riviera. The newest addition of the chain is Secrets Silversands at Bahia Petempich. Six stars luxury hotel resorts can be counted on one hand. For those who are looking for high-end exclusiveness, go for The Royal at either Playa del Carmen or Cancun.Or if you prefer isolation there's the Hacienda Tres Rios, a former eco-adventure park that couldn't face up the competition with Xcaret and Xelha. Here you'll find responsable luxury within a nature reserve. Two small resorts also worth mentioning are Paraiso de la Bonita at Bahia Petempich (close to the airport) and Eurostars Blue, at walking distance from Tulum ruins. The last one is considered by some to be politically incorrect due to its ownership by 'Los Bribiesca', the sons of former president Fox's wife and the fact that it's tecnically within a protected area. Well, I'm not here to judge anyone, and since it's already there so you might as well enjoy it. It certainly is a gorgeous hotel within stunning settings and a tranquil ambiance. Actually there are just too many luxury resort hotels, impossible to mention them all. Browse through these links below to find the one you like best.